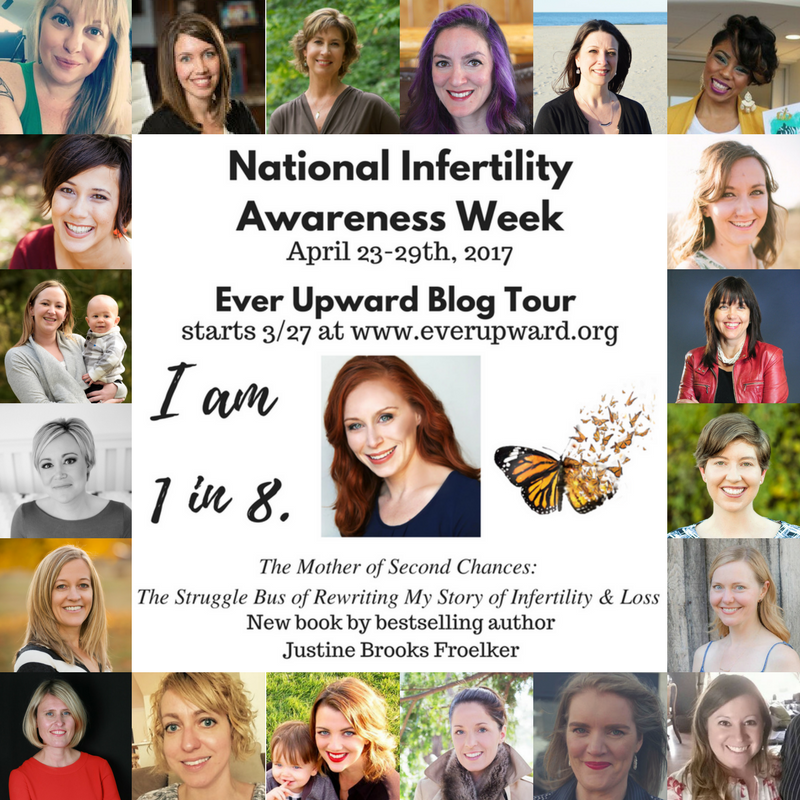 Today I am dedicating my blog to National Infertility Awareness Week and to the launch of Justine Brooks Froelker’s latest book The Mother of Second Chances, based on her blog Ever Upward releasing on April 17th. For five weeks 24 amazing women will share their stories of infertility and loss as part of this incredible blog tour, because together we can shatter the stigma. Yesterday Laura shared her story and tomorrow we will hear from Sarah at https://infertilityhonesty.com. We would love for you to participate by sharing these posts far and wide. We’d especially love to see your own broken silence by sharing your own infertility story using the hastags: #NIAW, #infertility and #EverUpward. Family. What does it mean to you? I’m a 47-year-old married infertile, whose parents have since passed on. My awesome sister is really the only biological family member that I regularly nurture in my life on a daily basis. Thank goodness for her — she accepts me lovingly as I am, as well as my decisions. I find myself reflecting often on the concept of family, togetherness, and the various ways that we all create our sense of bonding in our lives. Family bonds are so important in feeling a sense of belonging, support, and unconditional love. But what about for those of us who try to create a traditional family, and we discover that we are dealing with the disease of infertility in our own respective corner of the world? There is a vast emotional roller coaster to deal with after receiving an infertility diagnosis, and I’m here to tell you personally it is not a fun ride. It is fraught with twists, turns, and even dangers! Today, I am a proud infertility survivor. As women, most of us are raised to think that we’ll become mothers someday. As schoolgirls, my friends and I would all talk about how many children we hoped to have someday, what gender they would be, we even went so far as to pick out favorite names for our would-be children. From the first baby doll (which I totally had — “Rub-A-Dub Dolly” was my favorite) to the last baby shower, girls and women are constantly surrounded by images, ideals, and expectations from parents, teachers, peers, religion, advertising, and the media. It permeates everything. You can’t escape it even if you try. For some women, motherhood is their highest goal, as well as a large part of their self-image as a woman. The ultimate use of the female body — and for many, their highest ambition in life. My mother flat-out told me this. All she ever wanted for herself was to have two healthy children. And she felt jubilant and so proud that she realized that dream in my sister and I. That is absolutely beautiful and touching. I am so happy that my mom got to have that experience. But of course, it does give me pause and generate some sadness in me that I will not — and cannot — ever realize that dream. Also, society and our families want us to — and encourage us to — realize that dream. The pressures to marry and raise a family can be enormous! To some extent, the women who are unable to do those things can feel as though something must be deeply wrong with them or sorely lacking in their lives. Broken. I felt broken and sad for myself — and certainly confused about my future and how it would unfold. Studies show that, as a group, women with fertility problems are as anxious and depressed as women with cancer, heart disease, or HIV. One reason for this may be the physical demand of fertility treatments — blood tests, daily hormone injections, ultrasounds, egg retrievals, and surgery can all be a source of stress and emotional upheaval in women. Men are not pressured in quite the same way to become fathers. Sure there is some pressure, but not at the same level. I cannot imagine someone asking a man in a boardroom meeting: “So tell us, are you guys having children?” In stark contrast, yes, this did indeed happen to a female friend of mine at her boardroom meeting. She very eloquently responded to that question with “Hmmmm…I don’t see my uterus on the agenda today…” and then continued the meeting as planned without discussing her personal life. Asking personal questions such as these — ramming your own ideas about “what makes a family” down someone else’s throat — can be off-putting at best and come across as hurtful or even selfish at worst. It helps for all of us to try to think before we speak, act compassionately towards one another, and not assume that we know what is going on in someone else’s life. When I got questions such as these, and also when we were considering adoption but ultimately decided against it, it made me think that my husband and I weren’t enough on our own. Also, why can’t the friends and family in our lives respect both our boundaries as well as our decisions? How we decide to live our lives, handle our marriages and households, and how we build families are very personal concepts to each of us. In a free society, we all have a right to our own self-determination. Self-determination: the freedom to make our own choices; the process by which a person controls their own life; a characteristic of a person that leads them to make choices and decisions based on their own preferences and interests, to monitor and regulate their own actions and to be goal-oriented and self-directing. I have always enjoyed having the freedom to make my own choices about my life and my personal journey. But it can be very easy for self-doubt and self-criticism to creep in along the way. That can be made worse by questions, judgments, and criticisms from others about our choices, or our indecision, or the amount of time it takes us to get to where we are trying to go. The speediness and ease of someone else’s journey may be very different to say the least for our own journey. If we attach our self-worth to our actions and our ability to produce (in this case, produce children), we may be setting ourselves up for negative feelings, such as shame. Don’t hand over your self-worth to what other people think. This is a recipe for disaster! It will only turn you into a prisoner of “pleasing, performing, and perfecting” all in an effort to win the admiration of other people over. But what about your own well-being? Your own self-determination for what is right for you, your life, and your journey? The barrage of questions, judgments, criticisms from friends and family about “when are we going to have kids” and “what’s taking so long” and “why are you getting IVF, just take a cruise and relax” can tweak feelings of shame that we are somehow flawed, unworthy of the love of our friends and family, and that we no longer belong. They easily became parents whereas we have not. Why not? And woe is me. Here is where mindset and taking a look at our self-talk comes. Take note of how you are talking to yourself. Are you speaking to yourself kindly, as if you were talking to a very good friend who is going through a struggle? Check yourself and the words you are using. Are you saying to yourself: There is something wrong with my body. I will never be a parent. I can’t give my parents grandkids and that makes me a bad person. I don’t belong anymore. Or are you saying to yourself, I am doing the best that I can. Each day is a new day. Everyone has struggles that they deal with — infertility is just one of my particular challenges, and I will learn all I can, and take the appropriate steps to move in the direction that I would like to go. My self-worth is not attached to whether I can conceive. Today my husband and I are childless by choice. And while many don’t understand that, I do. And at the end of the day, that’s all that matters. I am happy with myself and my decisions. It is absolutely imperative that you believe in yourself throughout your infertility journey if you unwillingly find yourself on one. Believe that you have information, doctors and science at your disposal. Believe that you will be A-Okay whether you have your own biological children or not. You are a valuable, important member of society. You are loved—first by yourself, don’t forget! And you belong. We are all connected despite our differences. We are all more similar than different.